Mesenchymal stem cells (MSCs) are the nonhematopoietic multipotent progenitor cells found in various adult tissues. They are characterized by their ease of isolation and their rapid growth in vitro while maintaining their differentiation potential, allowing for extensive expansion in culture that yields large quantities suitable for therapeutic use. This article reviews the immunomodulatory activities associated with MSCs. Numerous studies have demonstrated that MSCs are potently immunosuppressive in vitro and in vivo. However, this article presents a new paradigm in MSC biology, in which MSCs, at least in vitro, can undergo polarization into either a pro-inflammatory or an immunosuppressive phenotype. Mesenchymal stem cells (MSCs) were originally described by Friedenstein and colleagues [1, 2] in the nonhematopoietic component of bone marrow where they participate in regulating hematopoietic stem cell maturation and emigration into the circulation. Since that time, they have been isolated from the connective tissue of almost all organs, including adipose, periosteum, synovial fluid, muscle, hair follicles, root of deciduous teeth, articular cartilage, placenta, dermis, umbilical cord, Wharton's jelly, lung, liver and spleen [3–5]. It has been posited that MSCs in these organs, like other stem cells, function as a source of cells for replacement and regeneration during normal cellular turnover, repair of injured tissue, or in response to biological aging. MSCs were identified based on their ability to undergo differentiation into mesenchymal lineage cell types, including bone, cartilage, adipose tissue, muscle and tendon . The differentiation capacity of MSCs was initially thought to be limited to their tissue of origin; however, studies have demonstrated that MSCs have the capacity to differentiate into cells of mesodermal, endodermal and ectodermal origins, at least in vitro [4, 6–8]. The therapeutic application of MSCs was suggested from early observations in preclinical animal models of disease, in which transplanted MSCs homed to sites of inflammation within damaged tissues where some of the transplanted cells underwent differentiation to replace injured cells. However, it quickly became evident in a variety of disease models that the levels of improvement mediated by MSCs do not always correlate with the levels of cellular engraftment and differentiation observed. As such, differentiation may not be a primary mechanism by which MSCs mediate tissue repair. Rather, it has been widely reported that MSCs secrete bioactive levels of soluble factors (growth factors and cytokines) capable of paracrine regulation of diverse disease-associated processes, including activation of tissue-resident stem/progenitor cells, apoptosis, stimulation of vasculo-genesis and inhibition of inflammation [9–15]. A rapidly growing body of literature indicates that MSCs possess immunosuppressive properties [16–23]. Therefore, the reparative function of MSCs observed in so many injury models may be, at least in part, attributed to the production of paracrine factors that direct inhibition of immune responses and function. It is also apparent that MSCs secrete pro-inflammatory cytokines that may enhance innate immunity. Increasing evidence suggests that activation of Toll-like receptors (TLRs), one of the early immune sensors, modulates this distinct MSC activity [24–29]. The underlying factors produced by MSCs and their immunomodulatory mechanisms are reviewed here. Additionally, a newly described mechanism of polarization in which MSCs can be induced to be either pro- or anti-inflammatory through differential TLR activation is presented. The immune suppression activities of MSCs were first described in ex vivo allogeneic co-cultures of leukocytes with bone marrow-derived mesenchymal stem cells (BMSCs) [16, 30–32]. These early observations instigated numerous studies exploring the immunomodulatory effect of MSCs derived from a variety of sources and species. BMSCs express low levels of human leukocyte antigen (HLA) major histocompatibility complex (MHC) class I, do not express co-stimulatory molecules (B7-1 and -2, CD40, or CD40L), and can be induced to express MHC class II and Fas ligand. These features are often used to explain their 'immune privileged' status in allogeneic hosts. Furthermore, BMSCs inhibit dendritic cell maturation, B and T cell proliferation and differentiation, attenuate natural killer cell activity, as well as support the production of suppressive T regulatory cells (Tregs) [16, 33–36]. While the mechanisms underlying the immune modulating property of BMSCs are not fully understood, they are dependent on the secretion of soluble factors as well as direct BMSC-to-immune cell contact . To date, at least 14 factors produced by BMSCs have been associated with their anti-inflammatory properties. Some soluble factors are produced by BMSCs constitutively while others are induced by BMSC interaction with inflammatory cells and factors commonly present in sites of tissue injury. The expression of indoleamine 2,3-dioxygenase (IDO) and inducible nitric-oxide synthase (iNOS) by BMSCs has been associated with repression of T-cell proliferation [37–39]. Recently, secretion of IDO by BMSCs was shown in vivo to both inhibit the proliferation of acetylcholine receptor-specific T cells and B cells and to normalize the distribution of Th1, Th2, Th17 and Treg cells in experimental autoimmune myasthenia gravis that is characterized by alteration in the balance of these four Th subsets . IDO catalyzes the conversion of tryptophan, an essential amino acid for T-cell proliferation, into kynurenine. IDO has been shown to exert its immunosuppressive effect through the local accumulation of tryptophan metabolites, rather than through tryptophan depletion . Expression of IDO by BMSCs was thought to be IFN-γ dependent [37, 41–44]. However, Opitz and colleagues  recently demonstrated that IDO expression in BMSCs can also be upregulated by activation of TLR3 and TLR4 via induction of an autocrine IFN-β signaling loop involving protein kinase R and independent of IFN-γ. Interestingly, when human BMSCs were treated with IFN-γ in vitro, they expressed extremely high levels of IDO and very low levels of iNOS, whereas mouse BMSCs expressed abundant iNOS and very little IDO. These data suggest there is species variation in the mechanisms of BMSC immunosuppression . Prostaglandin E2 (PGE-2) is emerging as a central mediator of many of the anti-inflammatory properties of BMSCs [5, 35]. PGE-2 is synthesized from arachidonic acid by cyclooxygenase (COX) enzymes COX-1 and COX-2. COX-1 is constitutively expressed in BMSCs and COX-2 expression can be induced by inflammatory cytokines such as IL-1β, IL-6, IFN-γ and TNF-α . Inhibitors of PGE-2 synthesis have been shown to abrogate BMSC anti-proliferative effects on T [16, 48, 49] and natural killer cells [48, 50] and almost completely abrogate the immunosuppressive effects of BMSCs in vitro . PGE-2 also plays a major role in the BMSC-mediated inhibition of dendritic cell maturation [51–53]. Nemeth and colleagues  showed in an animal model of sepsis that BMSCs (activated by lipopolysaccharide (LPS) or TNF-α) release PGE-2 that acts on the EP2 and EP4 receptors of macrophages leading to the production and release of IL-10, a potent anti-inflammatory cytokine, and decreased production of the pro-inflammatory cytokines TNF-α and IL-6. The reprogramming of macro-phages into a regulatory-like profile was also demonstrated in vitro by Maggini and colleagues . Transforming growth factor (TGF)-β1, a well-characterized anti-inflammatory cytokine, is constitutively expressed by BMSCs . Neutralizing antibodies to TGF-β1 have been reported to impair the immunomodulatory function of BMSCs on T  and natural killer cells . However, others have reported that TGF-β1 has no effect on the immunosuppressive properties of BMSCs [32, 55]. These discrepancies may be explained by the experimental conditions used in these studies. The importance of TGF-β1 in vivo was recently demonstrated in a mouse model of ragweed-induced asthma . Injecting BMSCs into ragweed-sensitized mice significantly improved lung pathology upon allergen challenge. The presence of pre-exisiting TGF-β-specific neutralizing antibodies eliminated the beneficial effects of the BMSCs; furthermore, injection of BMSCs derived from TGF-β1 knockout mice had no beneficial effect, suggesting that the BMSC-derived TGF-β1 is critical in suppressing the allergic responses. Treatment with BMSCs also increased the total number of Tregs in this model. Although Nemeth and colleagues did not directly connect BMSC-derived TGF-β1 to the recruitment of Tregs, Patel and colleagues  demonstrated that in co-cultures of peripheral blood mononuclear cells and BMSCs, TGF-β1 produced by BMSCs resulted in increased numbers of Tregs. Other factors associated with the immune modulating properties of BMSCs include HLA-G (reviewed in ), hepatocyte growth factor (HGF) [31, 59], leukemia inhibitory factor (LIF) [60, 61], IL1 receptor antagonist (IL1RA) [62, 63], CCL-2 , galectin-3, galectin-1 and semaphorin-3A [65, 66]. All of these soluble factors are capable of inhibiting T-cell proliferation, are highly expressed by BMSCs and thus may contribute to their immunosuppressive properties [65, 66]. More recently, a new role was advanced for TNF-α-induced protein 6 (TNAIP6 or TSG-6) in BMSC immunosuppression. Lee and colleagues  found that intravenously infused human BMSCs embolized in the lung and expressed high levels of TSG-6. TSG-6 secretion is known to suppress inflammation through the inhibition of the inflammatory network of proteases primarily by increasing the inhibitory activity of inter-α-inhibitor, sequestration of hyaluronan fragments and decreasing neutrophil infiltration into sites of inflammation [68–71]. In a model of acute inflammation induced by myocardial infarction, the knockdown of TSG-6 expression by small interfering RNA in human BMSCs significantly reduced MSC-mediated improvements of inflammatory responses. Furthermore, the administration of recombinant TSG-6 protein largely duplicated the therapeutic effects of the delivered BMSCs on inflammatory responses and infarct size . Together these results suggest that TSG-6 may play a key role in the anti-inflammatory effects of BMSCs. Though we are beginning to better understand the many complex mechanisms associated with the secretion by BMSCs of immune suppressive mediators like TSG-6, so far only a few reports have described the contrasting pro-inflammatory activity of BMSCs. Indeed, the observation of this divergent immune effect by the BMSCs came from studies primarily focused on the downstream consequences of TLR stimulation within these cells. TLRs are a conserved family of receptors that recognize pathogen-associated molecular patterns (PAMPs) and promote the activation of immune cells [72–76]. Many TLRs (TLR1 to TLR13) have been identified and characterized in a variety of immune cell types and species. Agonists for TLRs include exogenous microbial components, such as LPS (TLR2 and 4), lipoproteins and peptidoglycans (TLR1, 2, 6), viral RNA (TLR3), bacterial and viral un-methylated CpG-DNA (TLR9), and endogenous molecules shed following cell injury, including heat shock proteins and extracellular matrix molecules [72–77]. Specific agonist engagement of TLRs leads to the expression of inflammatory cytokines or co-stimulatory molecules by a MyD88 (a TLR adapter protein)-dependent or MyD88-independent signaling pathways and can promote chemotaxis of the stimulated cell. TLRs are differentially expressed on leukocyte subsets and non-immune cells and may regulate important aspects of innate and adaptive immune responses [24, 27, 75, 78, 79]. MSCs are among the cells that express an array of TLRs, including TLR2, 3, 4, 5, 6 and 9 [24, 27, 28]. Further-more, studies by our group established that the stimulation of MSCs with TLR agonists leads to the activation of downstream signaling pathways, including NF-kB, AKT and mitogen-activated protein kinase (MAPK). Consequently, activation of these pathways triggers the previously unreported induction and secretion of pro-inflammatory cytokines, chemokines and related TLR gene products. Interestingly, the unique patterns of affected genes, cytokines and chemokines measured identified the TLRs as potential players in the established MSC immunomodulatory properties as well as their ability to migrate towards injured tissues. Surprisingly, we noted that TLR4 stimulation with LPS led to the secretion of primarily pro-inflammatory mediators, such as IL-1β, IL-6, IL-8, IL-12, type I IFNs and TNF-α . Though unexpected, previous observations reported by Beyth and colleagues  recognized that LPS priming affected co-cultures of leukocytes with human MSCs and attenuated the expected human MSC-mediated inhibition of T-lymphocyte activation as well as affected their capacity to secrete interferon. More recently, Romieu-Mourez and colleagues  showed that TLR stimulation in murine MSCs similarly resulted in the production of inflammatory mediators, such as IL-1, IL-6, IL-8, and CCL5. Furthermore, they demonstrated that TLR and IFN activated murine MSCs injected within Matrigel matrices into mice resulted in the formation of an inflammatory site attracting innate immune cells and resulting in a dramatic recruitment of neutrophils. Raicevic and colleagues , studying the effect of TLR activation within MSCs in an inflammatory milieu, observed that this environment shifted the cytokine profile to a pro-inflammatory one rather than the expected immunosuppressive one. They similarly observed an increase in IL-1β, IL-6, and IL-12 after TLR activation in this inflammatory context. The effects of TLR engagement on the typical MSC properties of tri-lineage differentiation (chondrogenic, osteogenic, adipogenic) and proliferation have also been assessed. For instance, Hwa Cho and colleagues  described a role for TLRs in proliferation and differentiation of human adipose-derived mesenchymal stem cells (ASCs) . In another report, murine BMSCs were found to express TLRs that, upon activation, affected their proliferation and differentiation. In contrast to human BMSCs, they suggested that activation of TLR2 inhibits both differentiation and migration of murine BMSCs, while also promoting their proliferation. Liotta and colleagues  found that TLR activation had no effect on adipogenic, osteogenic, or chondrogenic differentiation in human BMSCs. Furthermore, this report suggested equivalent roles for TLR3 and TLR4 engagement in human MSC-mediated immune modulation in contrast to those reports mentioned above. Additionally, Lombardo and colleagues  reported that TLR3 and TLR4 engagement within ASCs increased osteogenic differentiation but had no effect on adipogenic differentiation potential or proliferation. Again different from the observations presented by Liotta and colleagues, it was also determined that TLR2, TLR3, and TLR4 ligation does not affect the ability of human ASCs to suppress lymphocyte activation. Though somewhat confounding, this recent body of work on the downstream consequences of TLRs provides emerging evidence for a new pro-inflammatory immune modulating role for BMSCs. The identification of the molecular details for this new pro-inflammatory BMSC role, and whether it is innate or just an in vitro artifact, awaits further investigation. However, this novel observation is important to consider given the accelerated use of BMSCs in anti-inflammatory cell-based therapies. Additionally, as Raicevic and colleagues  suggest, targeting of TLRs in BMSCs may avoid deleterious consequences in their use as anti-inflammatory therapies. By contrast, TLR-activated pro-inflammatory BMSCs could prove useful in breaking tolerance in the therapy of immune evasive diseases, such as cancer. TLRs are vital in coordinating not only the pro-homeostatic tissue injury responses of immune cells but also that of MSCs of various origins. The immune modulating activities of MSCs downstream of TLR stimulation seem to be more complex than originally anticipated. In an attempt to resolve the conflicting data between the immune modulating effect of TLR3 and TLR4 activation in human MSCs, our group has proposed a new MSC paradigm that takes its cue from the monocyte literature (Table 1). It is based on the premise that these heterogeneous cells can be induced to polarize into two diverse but homogeneously acting phenotypes (Figure 1) . Down arrows indicate inhibited effect; up arrows indicate enhanced effect; NC indicates no change or effect. hADSC, human adipose-derived stem cell; hMSC, human mesenchymal stem cell; LPS, lipopolysaccharide; muMSC, murine mesenchymal stem cell; ODN, oligodeoxynucleotide; poly(I:C), polyinosinic:polycytidylic acid; TLR, toll-like receptor. Short-term and low-level priming of TLR4 (left side) and TLR3 (right side) leads to the polarization of heterogeneous BMSC preparations into a pro-inflammatory MSC1 phenotype or an immunosuppressive MSC2 phenotype . The proposed agonists for the toll-like receptor (TLR) priming schemes are listed in the yellow boxes above the specific priming scheme. 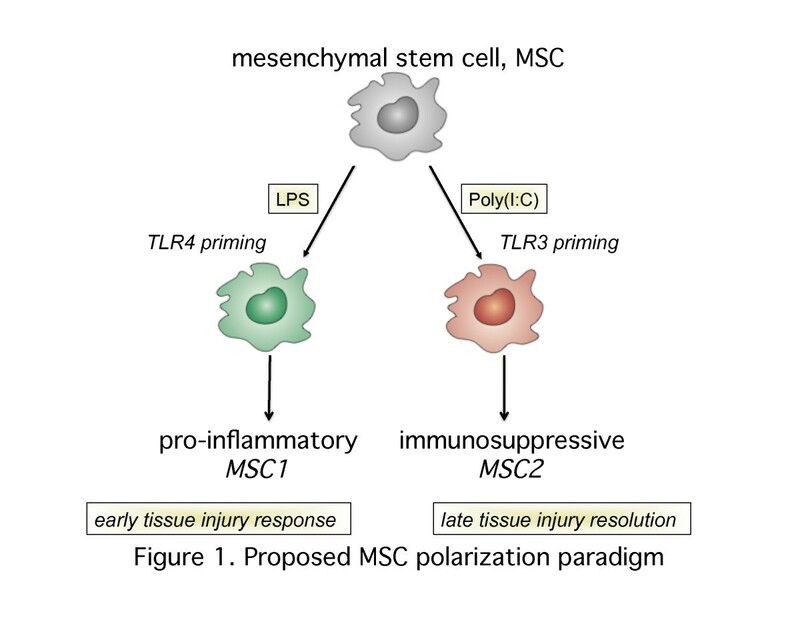 We speculate that MSC1 may contribute to early tissue injury responses while MSC2 may contribute to later tissue resolution responses based on similar contributions by polarized monocytes in wound healing [83–85]. Poly(I:C), polyinosinic:polycytidylic acid. Figure adapted from . It is established that stimulation of monocytes with known cytokines or agonists to their TLRs, including IFN-γ and endotoxin (LPS, TLR4-agonist), polarizes them into a classical M1 phenotype that participates in early pro-inflammatory responses. IL-4 treatment of monocytes yields the alternative M2 phenotype that is associated with anti-inflammatory resolution responses . Our group proposed that human BMSCs, like monocytes, are polarized by downstream TLR signaling into two homogenously acting phenotypes, classified as MSC1 and MSC2, following the monocyte nomenclature. The short-term, low-level exposure or 'priming' we described with TLR4 agonists polarized human BMSCs toward a pro-inflammatory MSC1 phenotype while the downstream consequences of TLR3 priming of human BMSCs polarized them toward an immunosuppressive (MSC2) phenotype. This novel MSC polarization paradigm is based on the consistent but novel outcomes observed for MSC1 when compared with MSC2 for several parameters, including dissimilar patterns of secretion of cytokines and chemokines and differences in differentiation capabilities, extracellular matrix deposition, TGF-β signaling pathways, and Jagged, IDO and PGE-2 expression . The most compelling outcome was opposite effects of each cell type on T-lymphocyte activation . Recently, our group has also observed that the infusion of MSC1 and MSC2 cells into murine models of inflammatory lung injury had disparate out-comes. The MSC1 cells aggravated the inflammatory injury, while the MSC2 cells were anti-imflammatory (unpublished observations). We suggest that an immunosuppressive phenotype has been detected for most current BMSC preparations because of the manner in which the cells are isolated from the host and the way they are expanded in ex vivo culture. Furthermore, we propose that the default BMSC phenotype must be immunosuppressive to avoid profound and deleterious consequences of a pro-inflammatory MSC1 phenotype on the hematopoietic stem cells that BMSCs maintain and support. While circulating or quiescent stem/progenitor cells are both equipped to respond to environmental cues, they must not actively engage immune cells or mediate repair while circulating throughout the body or maintaining hematopoietic stem cells in the bone marrow niche. In a manner analogous to the immature state maintained for monocytes, dendritic cells, and other immune cells, BMSCs are immune suppressive until a pro-inflammatory role is required to promote tissue repair. More than likely, TLR4-priming is not the optimal way to induce the MSC1 phenotype. It is expected that a combination of other factors, such as IFNs, or direct contact with other pro-inflammatory cells and their microenvironments along the lines of that reported by Romieu-Mourez and colleagues  and Raicevic and colleagues  will more readily induce the MSC1 phenotype. It also remains to be seen whether these newly described phenotypes are found in nature. Nonetheless, we believe that a greater understanding of the complexities driving the immune modulating properties of pro-inflammatory MSC1 and immunosuppressive MSC2 phenotypes will allow for more successful and effective targeted MSC-based therapies. Current evidence supports the utilization of MSCs for the treatment of the inflammatory component of numerous diseases and autoimmune disorders. It is evident that the mechanisms by which MSCs enhance tissue repair are more complex than originally believed. MSCs secrete a wide variety of pro- and anti-inflammatory factors that have the potential to affect multiple processes, such as apoptosis, angiogenesis and inflammation. Our group has defined a mechanism by which MSCs can undergo molecular signaling to be either anti-inflammatory, as widely described, or pro-inflammatory based on the differential engagement of TLRs. As the application of MSC-based therapy moves forward to the clinic, it is essential that we expand our understanding of the molecular mechanisms governing both the pro- and anti-inflammatory properties of MSCs so that we can enhance their therapeutic efficacy. BAB has focused on the cell biology of adipose and bone marrow stromal/stem cells for more than 8 years. He is currently a Professor in the Department of Pharmacology, Aron Family Regents Distinguished Chair and Director of the Center for Stem cell Research and Regenerative Medicine at the Tulane University School of Medicine. He is also the Chairman of the Division for Regenerative Medicine at Tulane National Primate Research Center. AMB is an Associate Professor in the Department of Microbiology and Immunology and a member of the Center for Stem cell Research and Regenerative Medicine and Tulane Cancer Center at the Tulane University School of Medicine. Her research focuses on immune modulation and increased migration of mesenchymal stem cells mediated by TLRs with the goal of using this knowledge to advance MSC-based therapies for cancer and other diseases. DES is an Associate Professor in the Department of Microbiology and Immunology and a member of the Center for Stem cell Research and Regenerative Medicine at the Tulane University School of Medicine. Her research focuses on molecular mechanisms underlying lung disease and the potential use of stem cells as therapy. The authors wish to acknowledge Ms Linda Ledet for excellent administrative and editorial assistance. The project described was supported by Award Number F31NS062588 from the National Institutes of Neurological Disorders and Stroke (NINDS), NIH/NINDS R21-NS059665, Louisiana Gene Therapy Research Consortium, and Tulane University to BAB. Funding was also provided to AMB by the National Institutes of Health 1P20RR20152-01 and Department of Defense OC073102 Concept Award and research support was obtained also from the Tulane Cancer Center and Center for Stem cell Research and Regenerative Medicine. AMB has a pending provisional patent application filed for the polarization of human MSCs into MSC1 and MSC2 and their clinical use in cell-based therapies. All authors prepared the outline and wrote the initial draft of the manuscript, edited and revised both the outline and draft manuscript, providing additional references and insights.